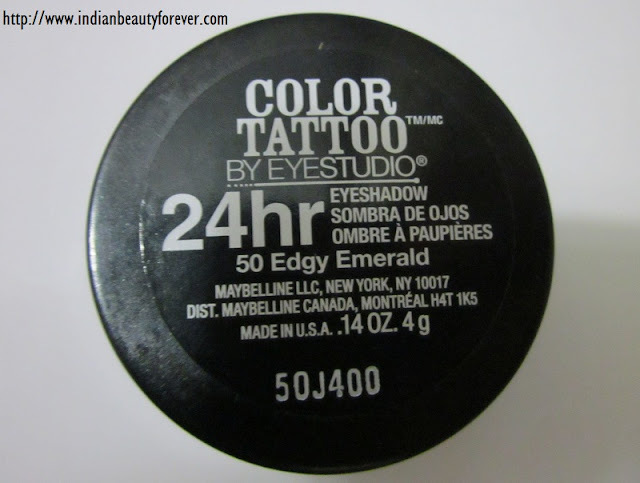 Maybelline color Tattoos have been really popular every since they hit Indian market. Our very own blog-o-sphere have been pouring reviews and swatches of them to help you judge and choose better. They very launched in 8 beautiful colors here i.e. Audacious asphalt, Bad to the bronze, Bold Gold, Fierce and Tangy, Edgy Emerald, Painted purple, Pomegranate punk, and Tenacious teal. 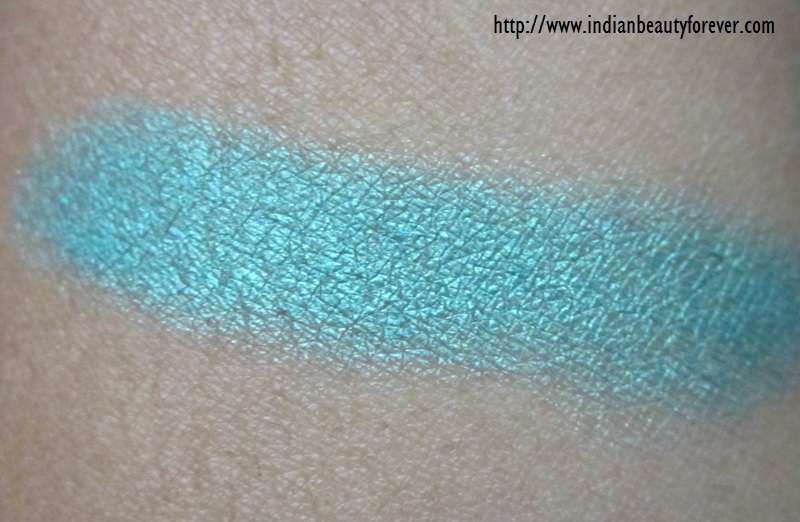 I will be swatching and reviewing Edgy Emerald today. What the company claims- Ink intensity. Tattoo tenacity. Dare to wear the longest lasting shadow. 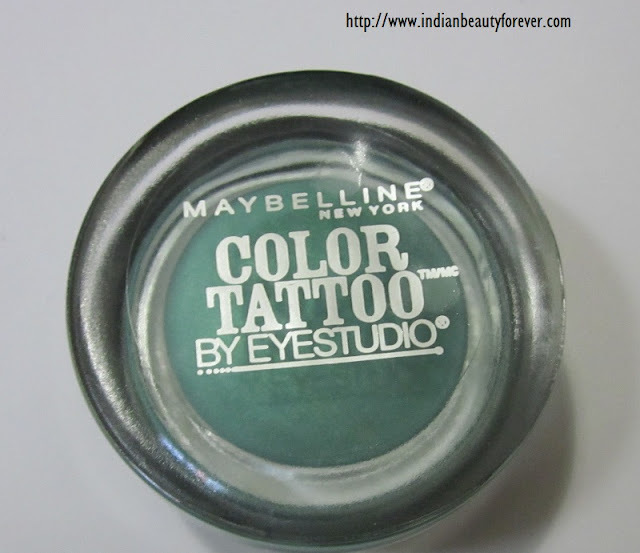 Maybelline's Eye Studio Color Tattoo's ink technology creates the most saturated shadow. Cream gel smooths on for vibrant, crease-proof color that never fades. Dare to get inked. It is 24 hour wear without creasing or fading, Ink pigments for intense color and Unique cream-gel texture. 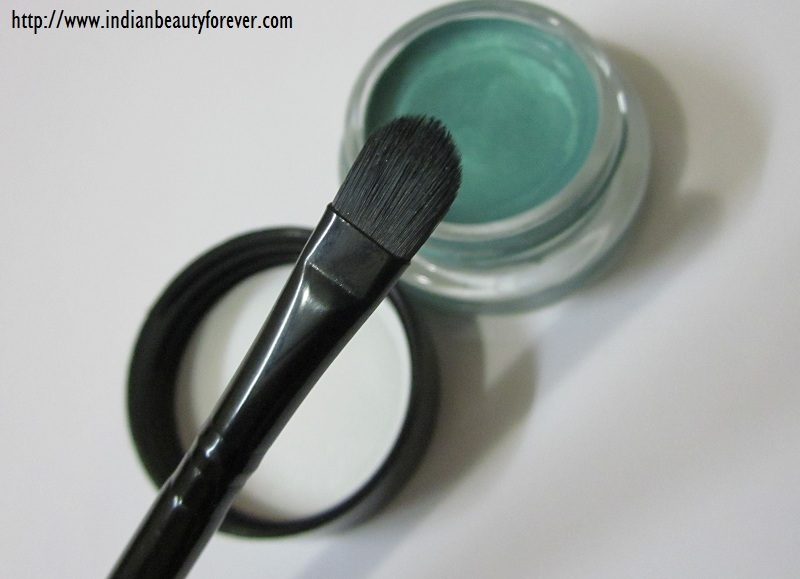 How to use-Use fingertip to smooth Color Tattoo Shadow over lids and then the brush. 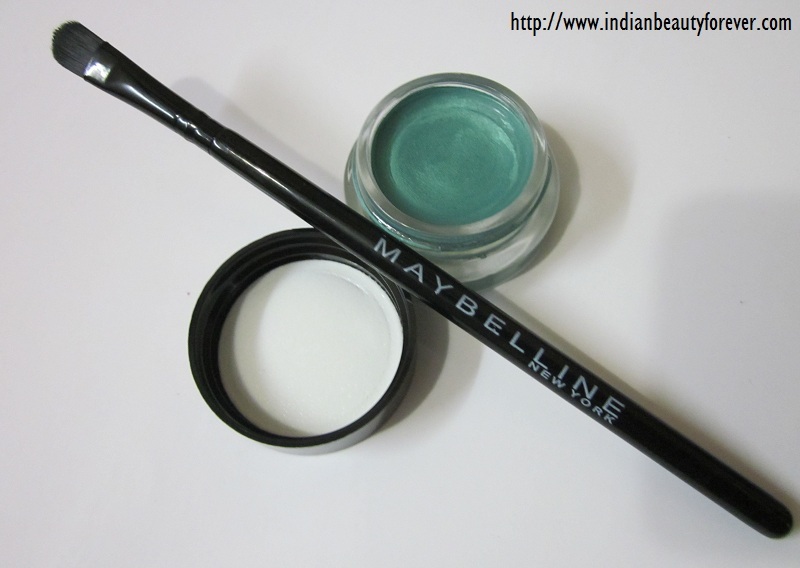 It comes in a heavy glass tub/pot which reminds me of Maybelline’s swirl gel eyeliner pot. Somehow I like that heaviness of the pot. feels good!! I still remember the first time I swatched it it felt so smooth and glided beautifully. It contains 4 grams of product and also comes with an eye shadow applicator but it can be easily applied with the finger tip. 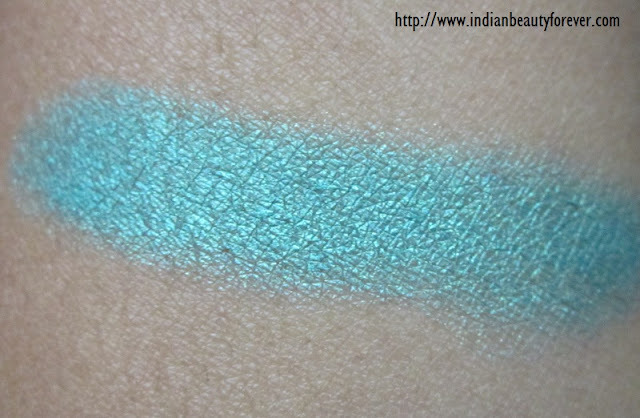 Edgy emerald is a bright and beautiful emerald teal color with very fine and subtle shimmer to the extent that in dim light it appears to be a matte shade but its more like a teal shade than emerald and very similar to Max factor earth spirits eyeshadow in ultra Aqua, which I have. 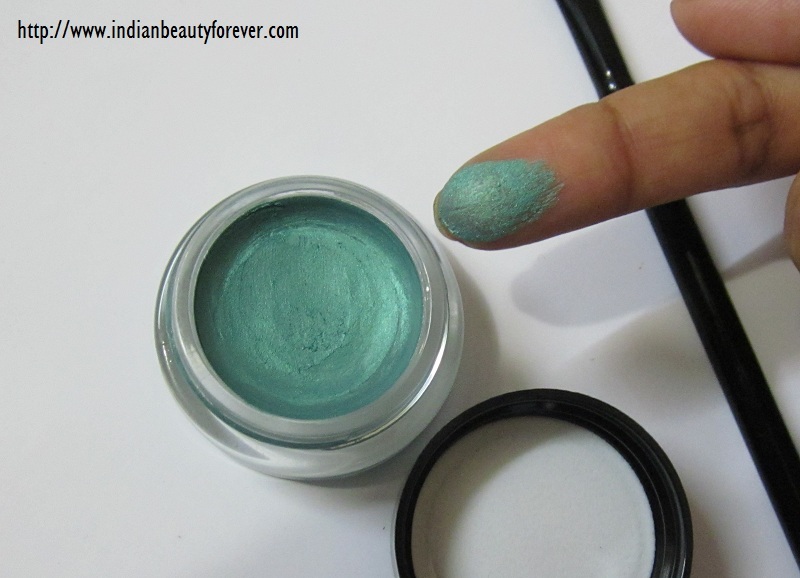 It has a very nice pigmentation and I noticed that it has a gel crème texture but it was kind of uneven which means that you have to be extra careful while blending it else it may turn out to be patchy. Did you see the above picture, no doubt, pigmentation is good but clearly shows the patches. Somehow, I managed to apply this with a primer before and it was there on my lids for around 7 hours but little creasing. which makes me conclude that they have a superb staying power. Moreover when I was at the counter, I swatched all of them on my arm, took the picture and did not wipe them and hid them under my full sleeve top :D.
To my surprise, they all were there without fading or smudging. Trust me you will need the makeup remover to remove them. Rubbing with water will not effect the color at all. Excellent staying power!!! comaparable to Maybelline swirl gel and that's the reason I said they have this gel creme type texture! Price is again what makes them worth trying, at that price, there is an applicator which comes along as well. but still I wish they could have blended well with more evenness. The brush is like a treat that is slender long with soft bristles that may also be used for eye makeup. the bristles picks up the product very well. Availability is not an issue now as it is easily available online and in the Maybelline counters. Packaging is really nice and the transparent bottom makes you to see the color inside but as it is made up of glass so be careful while working with it. Texture is like an intermediate between gel and cream. Price is reasonable for the amount of product provided and the superb staying power and also the brush that comes along with this. Staying power is excellent with zero smudging once it sets and you will need an eye makeup remover to take it off completely. Edgy emerald is a beautiful teal green color that may bring a pop of color to your eyes. It is waterproof so make sure to use a dual phase remover, cleansing milk may not help. Blending can be tricky or else it will become patchy. I wish something could have been done for it! My Take- Do consider it, if you want to try color tattoo and wants to have at least one of them or if you are in search of a smudge proof, waterproof eyeshadow range that can give you amazing color selection at an affordable price (including the brush too) and also ensure great pigmentation even after long hours of wearing this. Pretty Shade ! I have Bad to bronze and totally in love with it. What a gorgeous emerald shade!!! It is Parul:) I love this. niesha i think u love teal a lot right? Yes my darling..:) alot.. bohot saraaa..
Hai na..:) I am loving it!!! u wore this shade with ur diwali outfit na :) looks pretty! Nice color! I want to try them very soon. BTW, how is the applicator brush? Indeed they are very nice colors..:) Applicator brush is good with natural and soft bristles that helps in smooth application. I can't seem to find this particular shade in Greece, I love it though! I really like this shade I have it to I should use it more often. Wow I had read a review for the Fierce and Tangy some time ago but never knew this is a gel eye shadow and that it comes with an applicator brush. Thanks for including all details. And I was enticed by the title that says 'EOTD' but it's not there. This is such a pretty color, pls do an eye look with this. Its a nice buy at that price. I hv a ques. Just today I noticed my gel liner is hardening up the brush. Is it the same case with these eye shadows or your maybelline gel liner too? Do u need to clean the brush after/before every single use. I just came to know yesterday that gel products have a tendency to harden up. you are right Gagan, they can make the brushes hard in due course of ti,me, moreover, its always better to wash and keep the brushes clean so as to prevent any infection. :) Every time i use a gel thing i immediately wipe it with a soft cloth and then later clean them with baby shampoo after 2-3 use.